Ants in your house or business, not fun. Ants, especially common household ants, can be a huge problem in the warmer months. They will get in your butter, sugar and grains. You spray them with one of the cleaners under your sink and wipe off the counter and a couple days later they are back in force. You buy ant bait at the hardware and they eat it and keep coming. Small house ants in Virginia can access your home through the tiniest of openings and are relentless. They are social, selfless and communicate chemically. When you get tired of trying to stop a colony of invading ants call the professional exterminators and Brown. We can come out and inspect the property and give you a free quote to ridding your home or business of invading ants. There are several types of ants considered common household ants in Virginia; Odorous House ants, Pavement ants and Little Black ants (Yes, that is their name). All of these ants all look about the same. They are small, brown to black in color and annoying. A larger ant that will do some real damage to your home is the Carpenter ant. Carpenter ants are very common in Waynesboro, Staunton and Fishersville and can, if left untreated, cause structural damage to your house. Carpenter ants typically live in dead or dying timbers in the forest but if they find a suitable environment in your home, they will move right in. Commonly found in wood softened by timbers that are damp from a leak or sweating pipes. They will hollow out timbers in your home to make galleries in which they will make more carpenter ants. Carpenter ants are large and red to black in color. They are more active at night and if they are in a wall you will be able to hear them eating your house. Call today for a free inspection if you think you have carpenter ants or an issue with any ant that is invading your space. Brown Exterminating Co. services Waynesboro, Fishersville, Staunton, and Lexington Virginia areas in Augusta county and Rockbridge county Va.
Ants are one of the most common invading household pests next to cockroaches because they are organized and social (roaches are neither even though you may find them in groups). A scout ant can easily get into your home. One small ant can usually go unnoticed. This one ant is foraging for food and once it finds food the rest of the ants follow a chemical trail directly to the source. Now you will notice them, as there are numerous ants doing what ants do best, finding and storing food. They will form trails to the food source and keep coming until it is gone all the while the scout ants are looking for more food in your home. 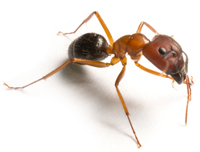 Brown Exterminating has a program for ridding your house from ants. Services ranging from prevention to spot treatment of an existing ant infestation and a monthly program designed to keep them out for good. One of our licensed inspectors would be happy to identify the ants and provide information on how we plan to rid your house of the invading ants. We service Waynesboro, Fishersville, Staunton, Stuart's Draft and Lyndhurst Virginia as well as Augusta county. Call today for a free quote. Fire ants are not in this region of Virginia, the Shenandoah Valley, but are currently found as far north in the United States as the south east corner of Virginia. Many times Allegheny mound ants are mistaken for fire ants as they live in mounds and are very aggressive, see below. Fire ants nest in the soil and build large mounds. Dozens, possibly hundreds of stings can be inflicted on a person accidentally kneeling or disturbing a fire ant mound. Fire Ants, are an introduced species that is notorious for its aggressive behavior. These ants can cause serious health problems for humans due to their aggressive nature and sting. They clamp onto their targets with powerful jaws and sting repeatedly. The sting of a fire ant injects a tiny dose of venom which causes a burning feeling on the victim. These tiny stings create blisters which will itch and eventually become infected. If you are sensitive or allergic to fire ant stings, and are stung enough, they can cause anaphylactic shock which could cause you to have trouble breathing or even faint. In sever cases, with allergic or very sensitive victims, fire ant stings can cause death. In addition to stinging humans, fire ants can also destroy seedling corn, soybeans, and other agricultural commodities. These insects feed on plant buds or fruit on trees and may remove bands of bark from young trees, killing tree. Controlling fire ants is difficult as the workers are very protective of the queen and very aggressive in making sure she is safe. If a fire ant colony is disturbed, the queen will quickly be relocated and immediately begin making a new colony. For this reason alone killing the workers that are probably attacking you is not a good idea or work very well. Once fire ants are identified, our licensed technician can apply a bait that will be taken back to the nest to be fed to the colony. Available baits range from being able to kill the queen or rendering the queen sterile effectively killing the colony . The use of baits is one of the best ways to eliminate a colony as they distribute the pesticide throughout the colony. Since baits are typically slow acting, the entire colony, including the queen is usually effected and the colony dies. Allegheny mound ants are aggressive and will come out in number if their mound is disturbed. They are a medium size ant with reddish head and thorax and dark or black thorax and legs. The worker ants make galleries with tunnels under the surface of the ground. Allegheny mound ant colonies can be as deep as 3 feet down into the soil. As they dig and enlarge their colony they pile excavated soil that makes up their mound, which could extend another 3 feet above the soil. They also collect organic debris to make their mound larger and you will see them foraging for scraps of leaves and small pieces of wood. Allegheny mound ant nests can be found in wooded areas as well as pastures and fields. They will also live in areas populated by humans but rarely infest a home. If they are found inside, which is unusual, they are typically foraging for food and may more commonly be found foraging on or around decks or patios on the outside of a home or business. They mostly eat insects or the honey dew from sap feeding insects. Worker Allegheny mound ants are known to protect aphids and other types of honey dew producing insects. In your yard these ants can cause damage to vegetation and trees close to their mound, within about a 40 foot radius. If you notice an Allegheny Mound Ant nest on your property do not disturb it. They will come out quickly by the hundreds, possibly thousands, and have a painful bite. Depending on the proximity of the nest and if there are more than one mound we can develop a plan to get rid of them. Smaller nests can be baited successfully larger colonies may require a more extreme measure to successfully eliminate the colony. Over the counter ant pesticides can work well if used properly. But multiple treatments, and knowledge of exactly what type of ant, is the most effective method as some ants common to Virginia may have more than one queen. Spraying them may disperse them into multiple colonies making the ant invasion worse. That’s why calling Brown Exterminating is the best solution for killing ants and keeping them from coming back. We have trained and licensed professionals to inspect your home for ants, identify the ant, and recommend the best solutions based on the type of ant invading your house. Contact Brown Exterminating today for a free inspection.